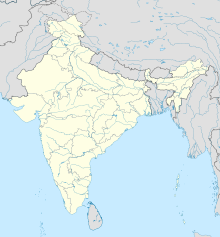 Kanpur Airport (IATA: KNU, ICAO: VIKA), proposed to be renamed Ganesh Shankar Vidyarthi Airport, is a domestic airport that was originally designated for the Indian Air Force in Chakeri, India. 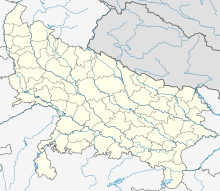 The airport is 17 kilometres east of city center and serves Kanpur metropolitan area as well as adjoining districts. Flight connectivity planned under RCS was delayed due to runway re-carpeting work. Anticipating growth in passenger traffic, the Airports Authority of India has planned to expand the Chakeri Civil Enclave. The airport would be developed in two phases. In the first phase of development includes expansion of the existing terminal building to increase the passenger handling capacity, construction of a visitors lounge and new car parking facilities to make existing terminal ready for RCS-UDAN operation. In the second phase, A new civil air terminal at Chakeri Airport will be built on a 50-acre piece of land adjacent to the airport boundary. The state government is handing over 50 acres of land identified by AAI free of cost for the development of civil enclave at Chakeri airport and also providing a 4-lane approach road to the new terminal building site. Work for boundary wall construction awarded to UPPWD under deposit scheme as per MOU signed on 24.11.2017. ^ a b c "Indian airports and the name game". India Today. 27 September 2018. Retrieved 21 December 2018. ^ "Traffic News for the month of October 2018: Annexure-III" (PDF). Airports Authority of India. 1 October 2018. p. 3. Retrieved 21 December 2018. ^ "Traffic News for the month of March 2018: Annexure-II" (PDF). Airports Authority of India. 1 October 2018. p. 3. Retrieved 21 December 2018. ^ "Kanpur (Chakeri) Airport, Airport Authority of India" (PDF). p. 4. Retrieved 12 May 2018. ^ "Kanpur airport to be named after Ganesh Shankar Vidyarthi: Yogi Adityanath". The Economic Times. 8 September 2017. Retrieved 10 February 2019. ^ "Launch of Adampur, Kanpur flights from Delhi delayed over terminal shifting". Hindustan Times. 20 December 2017. Retrieved 27 May 2018. ^ "Chakeri airport closes for two months - Times of India". The Times of India. Retrieved 27 May 2018. ^ "SpiceJet flight schedules". Official Website of SpiceJet. Retrieved 11 September 2018.